In Takayasu Arteritis, the arteries which become inflamed are: the 'aorta', which is the main artery that supplies blood from the heart to different parts of the body; and the 'pulmonary artery', which sends blood to the lungs. Other than the aorta and the pulmonary artery which become inflamed in Takayasu Arteritis, some of the other important arteries branching out from the aorta may also be affected by the disease. These arteries include the 'subclavian' arteries which supply blood to the arms, the 'renal' arteries which supply blood to the kidneys, the 'coronary' arteries in the heart, and the 'carotid' arteries in the brain and the head. Thus, Takayasu Arteritis can be described as a rare type of 'vasculitis disease', that is, a group of disorders which result in the inflammation of blood vessels. The blood vessels which become inflamed in Takayasu Arteritis in particular are the aorta and its main branches. Over a period of time, the inflammation in the walls of the arteries leads to the scarring, thickening, and narrowing scarring of the arteries. Takayasu Arteritis is considered to be an autoimmune condition, in which the immune system of the affected individuals' body attacks their own arteries by mistake. This disease may also get triggered by a virus or some other kind of infection; and can lead to Stenosis (blockages or narrowed arteries) or Aneurysms (abnormal dilation of arteries). 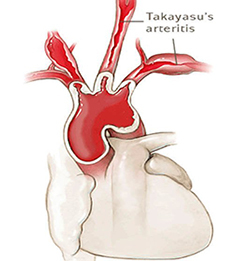 Takayasu Arteritis mostly affects girls and women aged between 10 and 40 years. Initially, some of the signs and symptoms which potentially hint at the occurrence of the disease are fatigue, mild fever, body aches and pains, and unintended weight loss. Anaemia (very low count of red blood cells). There is presently no cure for Takayasu Arteritis. Hence, the line of treatment for the patients suffering from this disease basically involves the use of medications for controlling the condition by providing relief from its symptoms. Some patients may require long-term treatment for the disease in order to prevent any possible recurrence of the inflammation of the blood vessels. Overall, the effective management of Takayasu Arteritis is largely dependent on the early detection of the disease, and easing its symptoms. Towards that end, some excellent herbal formulations offered by Plant Ayurveda herbal manufacturing company can be extremely effective. These formulations are prepared from 100% pure and natural herbs, under the supervision of renowned Ayurveda practitioners. These capsules are prepared by combining two widely-known anti-inflammatory herbal components --- Shallaki (Boswellia serrata) and Curcumin (Curcuma longa). Both the components have proven properties for treating anti-inflammatory and anti-arthritic conditions. Shallaki herb contains substances called ‘boswellic acids’ which can fight inflammation; and Curcumin (the most active compound in Haldi or Turmeric) is a remarkable antioxidant. The use of Boswellia curcumin capsules can increase blood supply to joint tissue, support healthy joint function by inhibiting leukotrienes, enhance the biochemical structure of cartilage, keep the cardiovascular system healthy, and provide comprehensive immune support. Recommended Dosage: Two capsules two times a day. For preparing these capsules, pure and standardized extract of the 'Gotukola' herb (Centella asiatica) are used. This herb holds immense significance in Ayurveda, and has been used in herbal medicines for centuries because of its ability to enhance the memory, and promote overall health of the body. The use of Gotukola capsules is very beneficial in managing Takayasu Arteritis because these capsules can maintain a healthy brain, support healthy blood circulation in the body, maintain healthy metabolism, and balance the body's three 'doshas' --- Vata, Pitta, and Kapha. Moreover, these capsules are also useful in balancing the psychic energies -- Satva, Rajas and Tamas -- in the body. Recommended Dosage: One capsule twice a day. These capsules are prepared from the bark extract of the ‘Arjuna’ tree (Terminalia Arjuna), which is believed to play a very significant role in the management of cardiovascular ailments. Arjuna has the capability to control blood pressure, high cholesterol, and high triglycerides; and can also effectively manage Coronary artery disease. The regular use of Arjuna capsules can strengthen the heart muscles, improve the blood-pumping ability of the heart, decrease in LDL cholesterol levels, maintain healthy blood cells, and support healthy blood circulation in the body. Recommended Dosage: Two capsules twice daily. To prepare these capsules, the standardized extracts of some very potent herbs are used. The herbal components of these capsules include: Arjuna (Terminalia Arjuna), Ashwagandha (Withania Somnifera), Brahmi (Bacopa Monnieri), and Shankhpushpi (Convolvulus pluricaulis). These capsules are extremely useful for providing strength to weak heart muscles, treating breathlessness because of weakened heart muscles, supporting the circulatory system, and cleansing the blocked arteries. Altogether, these capsules are an amazing natural formulation for managing high cholesterol, blocked coronary arteries, and congestive heart failure. Recommended Dosage: One capsule two times a day. These capsules are prepared from the ‘Guggul’ (Commiphora mukul) plant extract in the form of a yellowish-brown resin. Guggul has the ability to fight several inflammatory and degenerative conditions, strength the joints, and maintain a healthy nervous system. Guggul capsules are helpful in maintaining healthy muscles, promoting healthy blood circulation, maintaining healthy blood glucose level, reducing the fats in the body, maintaining healthy metabolism, keeping the bones and joint healthy, and promoting overall health and well-being. Planet Ayurveda's herbal formulations for managing Takayasu Arteritis are absolutely safe to use because they have undergone stringent quality, quantity and potency checks. Furthermore, these formulations do not contain any chemicals, additives, fillers, artificial colors, or preservatives.